This page is about caring for someone who is ill, but not terminally ill. 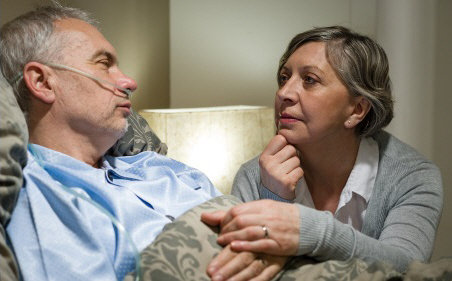 If you are caring for someone who is terminally ill, see Mouth care for someone who is dying. When people can't keep their mouths clean and clear – if they are very ill, or have a progressive neurological disorder – they need someone to do this for them. It's important, because it reduces the risk of infections in their mouth. A healthy mouth has an intact lining and is clean, moist, and pain-free. An unhealthy mouth can be very sore, dry, or infected. It can have a huge impact on the quality of life of someone who is unwell or has a progressive disorder. For example, it can make it difficult for them to eat or drink, or to communicate with others. Who can provide mouth care and how do I do it? Anyone, including family, whānau and caregivers, can perform this mouth care. 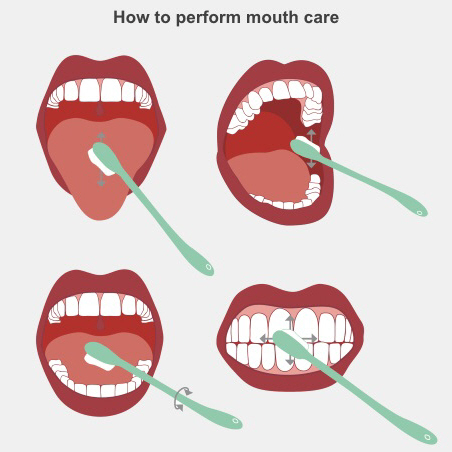 When you are providing mouth care for someone, it's most important to look inside their mouth once a day to look for redness, swelling, sores, white patches, bleeding, pain, or dryness. Tell their nurse or doctor if there are any changes. Mouth care should happen after every meal or snack. If the person is not allowed to eat (nil by mouth, or NBM), carry out mouth care every two hours, or even more often if needed. When you are using a swab, make sure you don't poke it too far back on the person's tongue, as this may make them gag. Before you start make sure the person is sitting up, or lying on their side – this protects their airway. mouthwash solution (the nurse or speech language therapist will advise you what to use). toothbrush and toothpaste (if the person you are caring for has teeth). Use only a pea-sized amount of toothpaste, and no water, to minimise the amount of foam and increase the cleaning action of the toothpaste. Dip the swab in mouthwash. Squeeze excess fluid from the swab. Wipe one area of the mouth with the swab. Throw away the used swab. Repeat in the next area of their mouth. Having a dry mouth can be very uncomfortable. If the person you are caring for is too unwell to keep their mouth moist, you can use swabs (over-sized cotton buds) dipped in water, or whatever fluid they like, to moisten their mouth and lips every one to two hours. If the person is drowsy or unconscious, familiar fluids and the touch of a family member can lessen the shock of having something placed in their mouth. Avoid iced water, as this can be a shock, especially if someone has sensitive teeth. Take particular care if their mouth is painful or has ulcers. Consider using choline salicylate gel (Bonjela), which you can buy from a supermarket or pharmacy. Make sure you keep their lips moist with petroleum jelly (Vaseline) or lip salves. If the person's tongue becomes sore, red, or covered with a fuzzy coating they may have oral thrush (candida). Tell their doctor, as this is easy to treat with antifungal drops. Regularly cleaning and moistening their mouth can help to prevent this. Written by community speech-language therapists, Canterbury DHB. Adapted by HealthInfo clinical advisers. Last reviewed October 2018.